We offer you as a tourist, a businessman or visitor of Ghent a pleasant stay in our city and we wish you sweet dreams in our Cuberdon B&B. Our house was built in 1927. It offers much light and space to its inhabitants due the many large windows. In 2004 we turned it into a B&B. The 3 guestrooms were constructed on the upper floors, while we live downstairs. In 2011 we provided each room with an individual bathroom. You can have a moment of peace in our stately house. Every room is equipped with 2 comfortable single beds (box spring mattress) and anti allergic bedlinnen. There's no carpet in the rooms so people with allergies can have a relaxed night. 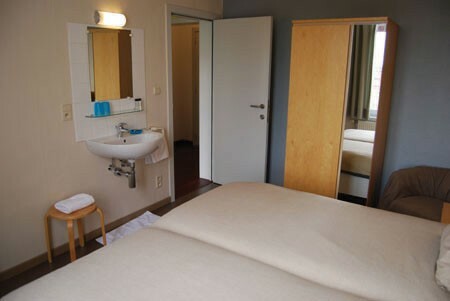 Each room has its own private bathroom (shower, washbasin and toilet), of which 2 ensuite. After a relaxed and quiet night, we serve you a delicious breakfast. The central theme is the 'cuberdon', a sweet and cone shaped candy typical for Ghent; it's also known as 'neuzeke', 'topke' or 'tsjoepke'. You'll find it everywhere in our house; not only can you taste it; it's also used in works of art, pictures and our logo. The location of our B&B offers a lot. You can get into the city centre in less than 30 minutes on foot or 10 minutes by bike. There's also the possibility to take public transport and there's the access to several bike routes. Both railway stations (Sint-Pieters and Dampoort), museums, Flanders Expo, the harbour, the departments of the university, the exit of the motorway (E40 Brussels-Ostend, E17 Antwerp-Lille) and several hospitals (like AZ Jan Palfijn and the university hospital) are easily to get to in less than 15 minutes. You cannot smoke in our house and pets are not allowed. Personal attention means a lot to us. 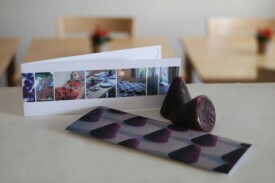 We are willing to give further explanation on touristic items or we can give you advice choosing a restaurant. We look forward to your arrival. No experiences yet with Cuberdon Bed and Breakfast. Be the first! Did you stay in Cuberdon Bed and Breakfast? Let us know what you thought about it and help others to make the right choice! * I confirm having stayed in Cuberdon Bed and Breakfast.